"No. 46 Bridge over Deh-Ge-Wan-Us Falls" from South Bank Glen Iris at Left (hidden) Letchworth State Park, N.Y. This colorful postcard was taken from approximately the same location as Image 40. It shows the third bridge built over Deh ga ya soh Creek (the creek referred to in the label is actually near the Portage High Bridge.) 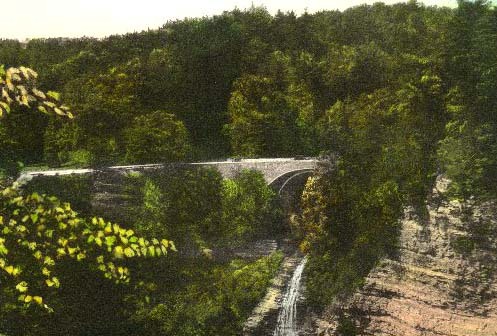 The Letchworth Park Committee had this bridge built in the late 1920s to replace the iron bridge which couldn't handle the growing automobile traffic in the Park. Visitors today still pass over this beautiful stone arch bridge as they drive South from the Castile Entrance toward the Glen Iris Inn. (See Image 42, Image 43, and Image 101 for images and information on earlier bridges. ).